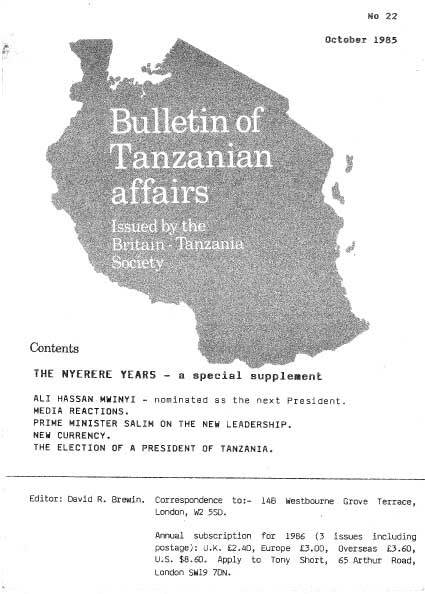 ALI HASSAN MWINYI – nominated as the next President. Julius Kambarage Nyerere was born at Butiama in 1922, a younger son of Chief Nyerere Burite, chief of a small tribe living near the east coast of Lake Victoria, the Wazanaki. He first went to school at twelve years of age, but within three years he won a place at Tabora Secondary School, at that time the premier school of Tanganyika. In 1943 he went to Makerere College in Uganda to read for a teaching diploma. On leaving Makerere he went to teach at St Mary’s Roman Catholic School in Tabora. From 1949 to 1952 he was at Edinburgh University studying history, economics and philosophy and on his return took up a post at Pugu Secondary School, near Dar es Salaam. In 1953 he became President of the African Association of Tanganyika and in 1954 of its successor organisation, the Tanganyika African National Union (TANU). In 1955 he resigned as a teacher to devote himself full-time to the work of TANU. In that year, and again in 1957, he addressed the Trusteeship Council of the United Nations in New York and in 1956 the Fourth Committee of the General Assembly. In 1957 he became a Member of the Legislative Council, but resigned in protest. In Tanganyika’s first elections in 1958 he was elected as a Member for the Eastern Province. In 1960 he was Chief Minister and in 1961-62 Prime Minister of Tanganyika. Tanganyika became independent in 1961. In 1962 Nyerere resigned as Prime Minister to devote himself to the work of TANU and to build a bridge between the nationalist movement and the elected government. In December 1962 Tanganyika was declared a Republic within the Commonwealth and Nyerere was elected President of the Republic of Tanganyika and in 1964, after the union with Zanzibar, of the United Republic of Tanzania, from which post, after being four times re-elected, he retired in October 1985. Bishop Trevor Huddleston CR is the President of the Britain-Tanzania Society. During his time as Bishop of Masasi in southern Tanzania, 1960-68, he was active in promoting the objectives of independent Tanzania throughout the diocese. This booklet is written by various hands to pay tribute to Mwalimu Julius Nyerere and to draw out the many-faceted contribution he has made to the life of his country and its people. My aim is much simpler: a brief and very personal sketch of a friendship going back nearly thirty years never, in the nature of the case, intimate, based on very occasional meetings and correspondence, but nevertheless an inspiration and a continuing joy for which I thank God. The only way I can describe it is by recalling those short moments of meeting at different times and to leave them to speak for themselves. I arrived in Dar es Salaam in 1960 as Bishop-elect of Masasi, knowing very little of what I would find in those last days of the run-up to independence. Much to my surprise, I learned that the Chief Minister (Mwalimu) had arranged a party for me in the garden of his house to give me the opportunity to meet some of his colleagues and some of the wider community in Dar es Salaam. It was a simple social gathering under the stars. I had with me the African priest, Father Leo Rakale, from South Africa, whom I had invited to preach the sermon at my episcopal consecration. For both of us it was the first time to be in an African country with an African Chief Minister and government: the first time outside ‘apartheid’ South Africa – though the same stars shone above us. I have never forgotten the sense of liberation we shared at the realisation that we were in a country free of institutional racism and ready to take its place as a sovereign independent state. And we were talking together with the man who – above all others – had led his country to that moment of hope. And how young and vital he was himself in 1960! In Alan Paton’s ‘Cry the Beloved Country’ there is a moment when a young white priest is talking to his equally young black colleague. And the black priest says: ‘I have one great fear in my heart, that when they (the Whites) are turned to loving, we shall be turned to hating!’ The black priest was, in fact, Leo Rakale and the white priest, ‘Father Vincent’, was myself. For both of us, in Mwalimu’s garden, the man who stood talking and laughing with us was a symbol of what could become true in South Africa if only . .. And no-one has been a more dedicated leader to that end than Mwalimu. This has been part of the ‘golden thread’ of our friendship through more than a quarter of a century and has certainly helped me to go on hoping against hope as ‘the sky grows darker yet and the sea rises higher’ in that Beloved Country. To celebrate the tenth anniversary of independence in 1971 the President and his government invited a large number of guests to visit the country for two weeks. The guests included the former Governor General, Sir Richard Turnbull, senior civil servants and ex-Provincial Commissioners and some churchmen like myself. I have yet to hear of any former colony (or the equivalent) making such a generous gesture and carrying it through with such an attractive programme of events. Mwalimu, of course, received all his guests at State House. There were safaris to the different Regions, a great parade in the stadium and a state banquet. Each guest on arrival paid his or her respects to the President and brought some gift as a token of congratulations on the anniversary. I brought with me a small book – of no great monetary value – called The letters of Sir Thomas More from Prison, because I knew Mwalimu would find it interesting. The fortnight came to an end and I asked the Chief of Protocol when I could call on the President to thank him for such a wonderful visit. I was told that as Mwalimu would be very busy with official farewells to the VIPs a letter would be sufficient and would in fact be a kindness at such a time. Of course I fully understood. But when I was eating a solitary meal at my hotel I was told that the President wished to say goodbye personally and would I go straight to his private house. He was alone in his study. Almost the first thing he said was ‘Thank you very much for that book. I’ve read it all and I found it fascinating.’ How many Heads of State at the end of an immensely busy fortnight of public events would have found the time to read such a book, let alone arrange to thank the donor personally? And so I could go on. I recount these very unimportant personal anecdotes for only one reason – and I could recount many more. They show me the quality of a great human being who has always treasured his human-ness (his humanity, if you like) more deeply than his office; who has always preferred approachableness to protocol; and who in leading his country through the first most testing years of its life as a sovereign independent state has set an example sans peur et sans reproche, which few others can rival and none surpass. For it is an example not only of humanity, but of humility. And that quality, in politics and statesmanship today, is rare indeed: as rare as truthfulness itself and as desperately needed in this turbulent world. Dr John Iliffe served for a time on the staff of the University of Dar es Salaam. He is now a Fellow of St John’s College, Cambridge. He was the author of A Modern History of Tanganyika, from which the following extract was taken (pp 508-5/0). Nyerere was racially sensitive, hated foreign rule, feared Conservative complicity with settler ambitions and knew that Africa was moving towards conflict and liberation. But he was no natural politician …. In Britain he apparently contemplated ordination. He wished to prolong his studies, but government refused to extend his grant. He feared to be rushed into commitment and action …. Events probably forced a final decision on him. (Reproduced by kind permission of the Cambridge University Press). His Excellency President Kenneth Kaunda has served as President of Zambia since October 1964. He is a personal friend of Julius Nyerere of long standing and has shared with him many concerns, including his devotion to the cause of African liberation. When one accepts to prepare an article about a close personal friend, one must expect accusations from the reader of biased praises. In this respect I am happy to say that no such accusation would hold water, because the life of Julius Kambarage Nyerere, President of the United Republic of Tanzania, is an open book. His contribution to the birth and growth of Tanganyika and, later on, to the birth and growth of Tanzania is something that needs no biased praise. It just needs correct recording of facts which speak volumes for the man’s contribution to the development of mankind as a whole. I first met President Nyerere in Dar es Salaam in the first half of 1958. I had gone to attend the World Assembly of Youth Conference held in the capital town of Tanganyika as Secretary-General of the African National Congress of Northern Rhodesia. I should mention here, by the way, that at that time he was being prosecuted for some offence. I don’t remember exactly what it was, but it was a political offence for trying to blow up the British Empire like many other political leaders in the colonies at that time. Hundreds of TANU supporters naturally came to attend his trial. Back to my story of my early meetings with President Nyerere. Between September and October 1958 the Northern Rhodesia African National Congress was split and I led the Zambia African National Congress, which was banned after only five months of existence. Out of it was born the United National Independence Party. As President of the new Party, I was enabled to meet President Nyerere as leader of my own party and in my own right. We then struck up a friendship that has given me this rare opportunity to write about him. Julius Kambarage Nyerere is a man of rare qualities, an outstanding intellectual – honest intellectual, I might add – mass mobiliser and organiser, administrator and lover of mankind all rolled into one. His humility is very appealing. An outstanding visionary, he is also a Pan-Africanist and internationalist of great courage. His achievements abound! He led the Tanganyika African National Union (TANU) in the struggle for independence completely on a nontribal and non-racial basis. The construction of a strong and unified nation has stood the country in very good stead. It was a well calculated and well organised base. Tanzania is rated to be one of the poorest countries in the world, but he has taught his people to believe in self-reliance. This belief in and acceptance of self-reliance has led to Tanzania being one of the most literate populations on the continent of Africa. The unification of Tanganyika and Zanzibar and the consequent stability of the United Republic, the readiness of the people of Tanzania to shoulder their responsibilities towards struggling colonial peoples in the Southern African Region, are only a few of his achievements. 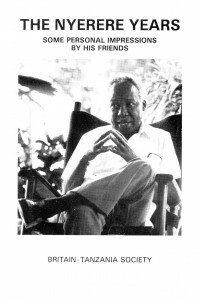 Tanzania’s contribution under Julius Kambarage Nyerere’s leadership to the liberation of Zambia, Mozambique, Angola, Zimbabwe and, indeed, the continuing liberation struggle for the independence of Namibia and the fight against apartheid in South Africa are too well known to need elaboration now. It is sometimes forgotten that he was the moving spirit behind the expulsion of the Republic of South Africa from the Commonwealth of Nations because of apartheid. It is in grateful recognition of his services to all of us former colonial peoples in Southern Africa that I personally proposed his name for the Chairmanship of our Front Line States, a post he has held up to this point in time. Only a man of his calibre and commitment to the cause of man the world over could have enabled us to work together so well and so effectively in our tasks of assisting the various liberation movements in our Region of Southern Africa to fight and defeat the evil forces of colonialism. Of course he has created problems for himself too and these are real ones! In his determination to take power to the people, he nationalised all the major means of production and distribution. In my opinion that was not wrong. He was – as leader and servant of his people – merely implementing the decision they, the people of Tanzania, had made as a result of their deliberate and conscious national agreement that led to the Arusha Declaration. But as he has himself admitted publicly, he and his colleagues failed to realise the importance of developing a dependable leadership cadre in the management of those enterprises – an ongoing process in any given human situation. It is not policy that was wrong, it is the execution of those policies that ran into difficulties. There is a difference between the two. Unfortunately, the situation was made worse by the intermittent droughts and conditions laid down by some lending institutions for Tanzania which he could not accept for very understandable reasons. The result was discussions were deadlocked. He took this line in defence of his people’s interests. People anywhere on earth can only take so much and no more. This was a fair and just stand. Typical of the man, he has used the last few months that he is serving his country as President of the United Republic of Tanzania to fly to many, many countries from which the country received various forms of aid to go and thank them all in person. I should have pointed out that many Heads of State and Government as well as close colleagues and friends – I am one of them – tried to dissuade him from retiring, fearing the irreplaceable gap he would leave behind both nationally and internationally would be difficult to fill. But Julius Kambarage Nyerere had made up his mind and there was no going back! From the little I have catalogued of his activities, the balance sheet is clearly in favour of Julius Kambarage Nyerere. His monumental achievements for Tanzania and the people of Southern Africa, and indeed beyond, cast into insignificance whatever errors he might have committed as a human being. From what I have been able to witness of his activities, I am in total agreement with the people of Tanzania for giving him the name of Mwalimu – meaning the teacher. He is! He will always be! Paul Marchant served as a District Officer in Musoma and was for a short time Acting Chief of the Zanaki, the Chiefdom in which Julius Nyerere was born. Nyerere was a student at Edinburgh University from 1949 to 1952 and became the first Tanganyikan MA. There are sometimes chance meetings which change one’s life. There are other meetings to which there is a great build-up and yet which leave nothing behind. This one was different. There was certainly a build-up, with elaborate preparations being made, but when the meeting actually occurred it was all but overwhelmed by events, which took almost everyone by surprise, but which left none of the participants unchanged. The return home of Tanganyika’s first overseas graduate was an event eagerly awaited, not least in his home District of Musoma. Preparations of all sorts were being made and the arrival was expected by Lake steamer on Sunday morning. It was decided that I should give a lunch party on the day of his return to our local boy making so good. I invited some twenty guests. Of the eleven Chiefdoms in Musoma District with which I had to deal, it was the central one, Zanaki, the most mountainous and the one with fewest roads, which occupied the greater part of my time. Shortly before my arrival in the District there had been a major reorganisation in Zanaki, which had been split into eight small Chiefdoms. Now it was united under one Chief, Ihunyo Monge, a famed rainmaker, who was assisted by two deputies, one of whom was Edward Wanzage, Julius’s half brother. It was hoped that the Chief would concentrate on his rainmaking and leave Edward Wanzage and others to bring Zanaki into the modern world. Things however did not quite work out like that. It became evident to me that there was considerable discontent in the Chiefdoms and that Chief Ihunyo was not prepared to allow his younger assistants to undermine his position. A much delayed ‘baraza’, or Chiefdom meeting, was arranged on the football field two days before the expected arrival of Julius in the District Headquarters town of Musoma. But the meeting was not held, as Edward Wanzage and the others with us were driven from the field by a hostile crowd. On the morning of the arrival of our local hero, I, his lunch-time host, was trekking the hills and valleys of his homeland Zanaki in company with Edward Wanzage in search of those who had led the disturbance. It was my colleague David Brewin who became the host. Some time after midday, Edward and I arrived at the back door of my house tired, dirty, unshaven and with our clothes rather tattered. We entered the living room and there, half sitting on the table, with a beer mug (or some such) in his hand and already haranguing the assembled guests (Julius was always a good speaker) was Edward’s long gone brother. Julius turned and smiled at the sight the two of us presented. It was our first meeting, but only the first of many that were to follow in the next couple of months as I became Acting Chief of Zanaki and Julius helped a number of Catholic priests better to understand the Zanaki language. I remember one day in particular. I had sent out in different directions all the Chiefdom personnel with whom I was working and I then found that I had no one left to clean out the outside latrine at the disused gold mine in which I had taken up my residence. So I set about it myself. Who should arrive on one of his not infrequent visits but Julius. Ronald Neath first met Nyerere in 1955 when serving as District Commissioner in Masasi. From 1959 to 1962 he served on the staff of the Prime Minister in Dar es Salaam occupying an office adjoining that of his chief. One of his tasks was to help in arranging the Prime Minister’s programme of engagements. One episode just before independence I shall always remember. In accepting their invitations to attend the celebrations one or two Heads of State or Government had made it plain that they would like to be accommodated during their stay in Mwalimu’s official residence and I was asked to raise the problem with him. ‘That’s an easy one,’ he replied in a flash, ‘tell them no one is going to stay in my place except the Wilsons.’ Mrs Wilson had welcomed Mwalimu to her home in Edinburgh when he was studying there. The Prime Minister was able to go to Dar es Salaam airport to receive personally only a small number of the Heads of State, prime ministers and dignitaries who arrived for the celebrations, but typical of Mwalimu the man he was there himself to welcome Mrs Wilson and her son. David Brewin lived in Tanganyika for fifteen years, first as an agricultural officer, later as Principal of Ukiriguru Agricultural Training Centre and subsequently as Assistant Director of Training in the Ministry of Agriculture. He founded the magazine Ukulima wa Kisasa. Mrs Wilson first went to Africa to join her doctor missionary husband in Angola in 1926, but since meeting Julius Nyerere she has visited Tanzania several times and close relations have developed between the families. Her most recent contact has been with the President’s daughter, who is studying at Stirling University. Charles (‘Kim’) Meek entered service in Tanganyika as a District Officer in 1941. By 1959 he had risen to become Permanent Secretary in the office of the Chief Secretary and from 1960 to 1962 he served as Permanent Secretary to the Prime Minister (Nyerere) and Secretary to the Cabinet. In September 1960, I was standing on the steps of an office block on the Dar es Salaam seafront, waiting to welcome the new Chief Minister to office. It perhaps seemed rather unlikely that we would get on well together. The TANU leadership had had their own preferred candidate to head the civil service and, when my appointment was mooted, three of them had waited on the Governor to press the claims of their man against mine. Luckily they were dismissed with a flea in the ear, or I would have missed the job of a lifetime, but it would be understandable if Julius felt resentful that I had been thrust upon him. As for me, I had my full share of prejudices against the nationalist tide that was pushing us aside so abruptly. Still, I had admired my new master’s style in the Legislative Council; and a couple of years earlier, when we were not supposed to ‘fraternise’, I had gone out to some of his huge rallies on the old aerodrome and sat on the ground amidst the African crowd, and been deeply impressed by his logical thought and the power of his oratory. If these doubts and reservations really existed, they did not survive the first handshake. From the very start our brief partnership of fifteen months was one of complete mutual trust. Trust was badly needed too, for this was by no means the sort of relationship that subsists in the United Kingdom between a Minister and his chief official adviser. I was certainly the Chief Minister’s man, but I also had my loyalty to the Crown in the person of the Governor and towards all my British colleagues in what was bound to be a very difficult time. Julius understood this perfectly well and appreciated that I had other lines of communication to use, but one or two of his colleagues were much more suspicious. What had I been talking about at Government House? What plots were being laid at my weekly meetings with the Permanent Secretaries (all British)? It was even put to me by one Minister that I was putting Julius at risk by failing to ensure that the Government aircraft were properly serviced. Since I used them frequently myself, this struck me as a bit far-fetched, but the tale illustrates how difficult some of the party leaders found it to throw off the spirit of struggle against the British colonialists. Not so their leader, for he had entire confidence that the system was now working for him, and one of his first duties, faithfully discharged, was to persuade his followers that this was the case and that authority must not be flouted unless they wanted to wreck their own African government. Law and order, indeed, was an early and worrying preoccupation. Why pay taxes, now that our own TANU is in charge? What do these white DCs count for these days? Julius was soon touring the country, rubbing into the cheering crowd that black governments needed money at least as much as white ones, and that the law must be observed, whoever was in control. This campaign did a lot to assuage the fears of British civil servants in the field. All through these nervous times there was a lively apprehension that the lot would take their compensation and go at the moment of independence, the more so as political heads were being moved into districts and provinces alongside the white administrators who had been used to running their own shows for so long. Julius signed a personal letter to one and all to beseech their continued help into independence. The other side of that coin was the frantic effort to Africanise the civil service, the field where we had been so dilatory when independence appeared to lie years ahead. Crash courses, division of jobs, back-seat driving, lower standards, every sort of measure was crammed into the few months available, with a very fair measure of success. There were difficulties too with Union leaders who looked on their movement as a parallel arm of government with the party. Julius put them in their place, and he trounced even more severely the black racists in his party who would have denied citizenship to browns and whites. This he did just before independence in what was by then the National Assembly in a speech of tremendous eloquence even by his standards, and he did it with such passion and sincerity, staking his government’s future on the result, that he overwhelmed the opposition. Then there was a climactic row about money when Britain, then undergoing one of its periodic bouts of financial crisis, proposed to cut its dowry of grants and loans, on which the new state proposed to found its development plans during its first three years. Here the part of the Prime Minister, as Julius by then had become, was to restrain himself and, more difficult, restrain his colleagues from public recrimination and a repudiation of Britain’s offer which even at that late stage would have poisoned irretrievably the whole atmosphere of peaceful transition. Here Sir Richard Turnbull’s powers of persuasion were the saving grace when he flew to London to argue with Ministers the consequences of rewarding peace and moderation in a niggardly way. Then there was South Africa and its application to join the Commonweath Conference in March 1961. Into this issue was injected Julius’ famous article in the Observer arguing why ‘ … to vote South Africa in is to vote us out.’ Technically, Julius was acting outside his powers, since foreign affairs were in the hands of the Governor until independence. Realistically, on the other hand, it made sense to make it public that Tanganyika at least would not join the Commonwealth alongside South Africa, and no doubt other black African states would follow Tanganyika’s example. Julius was on a brief holiday when we got wind that this article was due to appear in a few days’ time and the Governor instructed me to don my other hat and go in pursuit of him to put the British Government case and try to persuade him to withdraw it. I flew off on this forlorn mission to the Mambo airstrip, where a car was waiting to take me up the mountain road to the Governor’s Lodge at the resort of Lushoto. This had been a favourite spot of Julius’ old antagonist, Governor Twining, and I felt his shadow in the heavily panelled room where Julius and I dined on our own that night. Needless to say, my arguments had not the slightest effect upon him. He had simply said what he absolutely believed, and it was right and important that he should give ample notice of what he intended. In the event, the article was a powerful factor in persuading South Africa to withdraw its application. At the start of our association Julius was coming to office as Chief Minister with no inside knowledge of the machinery of government and, as some Society members have heard, he tells some hilariously embroidered stories of how in his early days I saved him from the grasp of the Taiwanese Chinese or wrote his first minute to the Governor. In fact, as every member would expect, his immense intelligence and acute political sense soon told him very exactly what was likely to work and what was too much to expect, and within days we were a team. He was very frank always about his political difficulties, which were considerable for he had some rough players in his team, from whom from time to time I had to seek to protect some of my colleagues, quite apart from my own blazing rows with his own Minister of State. We disagreed very rarely, and never painfully, because he always knew he was getting honest advice, and, where we did disagree, later events suggested that he was more often right than I. I forget the subjects of dispute now, but there was one where he knew I was in the right as well as I did, and this led to a bitter explosion – why was he dealing with this kind of issue, when he ought to resign and get back to the grass-roots and revivify the Party? I said conventional British things about how the whole country depended upon him. In his inimitable way, he wanted to know what a country was worth if it all depended on one man? It was the clue to his resignation within a month of independence. Meanwhile, family friendship was born. When he became Prime Minister, Julius moved into the former Chief Secretary’s house, a hundred yards from us. Readers will have gathered that this was a very crowded time of unremitting work, and politics pursued Julius home at the end of long days. So he often came for refuge to us, for a drink and a scrambled egg for supper, and my wife became friends with Maria also, and sometimes by day his eldest boy would come with him and play snakes and ladders with our youngest. So to ‘uhuru’ itself and all the celebrations, and off I went for six weeks’ leave, and back we came to find Julius resigned, and off we shortly went for good. But whenever we meet him now, it is as though we had parted ten minutes before.